simplecall brings you an amazingly cheap service that allows you to make cheap international calls to anywhere in the world. To start using simplecall all you need to do is dial the local access number followed by the destination number and the hash key and you will be connected – it's that simple! experience state of the art features – all for free ! simplecall brings you lots of benefits and features. Apart from allowing you to make cheap calls internationally, you also get several other features such as the ability to top-up online and check your call history online. In addition to this, you also can subscribe to our call direct feature, which allows you to make one-touch calls to your favourite contacts. 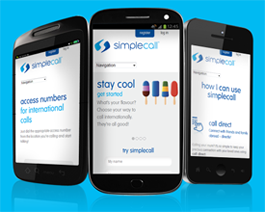 simplecall is PIN less, which means that you don't have to dial a complicated PIN or other code, making calling simple. To start using simplecall and its extensive list of features all you need to do is register with our service. It is free and quick to sign up. Once you have registered with us, you can start making all the cheap international calls you want!